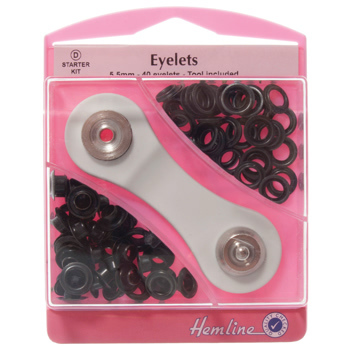 Starter set contains: eyelets, washer, hole punch and eyelet tool. Featuring all new non-spill plastic case and all new higher quality application tool. Nickel, 40 sets - 5.5mm, 0.25in. 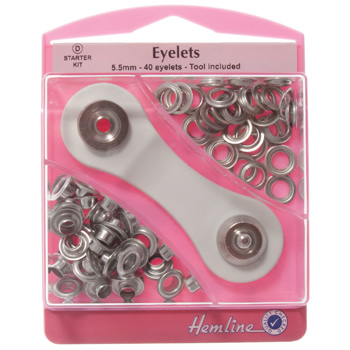 Starter set contains: eyelets, washer, hole punch and eyelet tool. Featuring all new non-spill plastic case and all new higher quality application tool. Gold, 40 sets - 5.5mm, 0.25in. Starter set contains: eyelets, washer, hole punch and eyelet tool. Featuring all new non-spill plastic case and all new higher quality application tool. Bronze, 40 sets - 5.5mm, 0.25in. 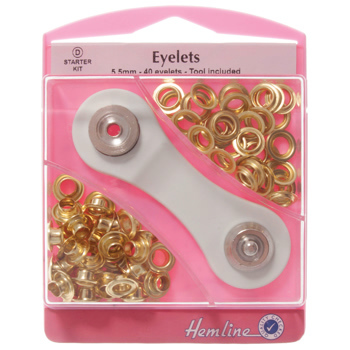 Starter set contains: eyelets, washer, hole punch and eyelet tool. Featuring all new non-spill plastic case and all new higher quality application tool. Black, 40 sets - 5.5mm, 0.25in.